Are you ready for a class unlike anything we've ever hosted at LitReactor? Are you ready to commit to stretching your writing boundaries? 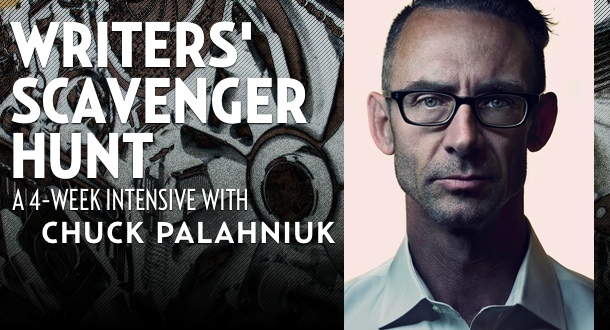 Are you ready to work on your craft with acclaimed author Chuck Palahniuk and a classroom full of enthusiastic writers? Most importantly... are you ready to have some fun? Welcome to Writers' Scavenger Hunt. This four-week intensive is a cross between a writing workshop and a scavenger hunt. Each week, Chuck will describe a storytelling technique to you. And then you'll be tasked with finding examples of that technique. Your example could come from history or pop culture. It could be from a book or a movie. Doesn't matter. You just have to be able to find a place where the technique has been used effectively. Then, you'll bring your example to the table—and write something in which you utilize that technique. It can be a new piece of writing, or you can apply it to whatever you're currently working on. Each week will bring a new challenge. And each piece of writing you put forth will be critiqued by both Chuck, and by your fellow students. Along the way, there'll be opportunities for discussion on the craft of writing. This is a new class concept, and one we're thrilled to try out. If you're in, you'll have to buckle down, so show up prepared to work—but more importantly, be prepared to have some fun! * We kindly ask that students who've taken this class previously please resign from signing up again.